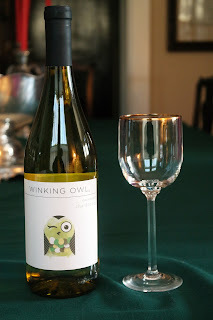 My friend's daughter, Sarah (named changed to protects privacy), wanted a group of us grandmothers to test this $3.00 Aldi, Winking Owl chardonnay. Sarah is planning to serve it at an open house, but the cheap price frightens her. We found it perfectly acceptable. Personally, as someone who has suffered through bad chardonnay in restaurants, I thought it was pretty good. I've stopped ordering wine in restaurants because I am often served something, regardless of cost, that is just plain, well, to put it politely, swill. Now, when I eat out, I order a cocktail, or two. Much more likely to get something pleasurably drinkable. Back to Winking Owl, we thought it was fine, and the label was cute.